Scheduling - It's Easy. It's Fast. It's Mobile. Simplify employee scheduling and communication for your business. ​Most businesses spend an average of 8 hours per week or more on employee scheduling using programs like Excel, or even worse— a pencil and paper. ​Employee scheduling software can help you build your schedule for the week in as little as 15 minutes. ​When I Work is an employee scheduling app that does more than just save you time on scheduling. It also helps you improve communication, eliminate excuses, boost accountability among your staff, track time and attendance, and grow your business. ​Put the schedule in everyone's pocket. Schedule and communicate with your employees from your Android or iPhone. 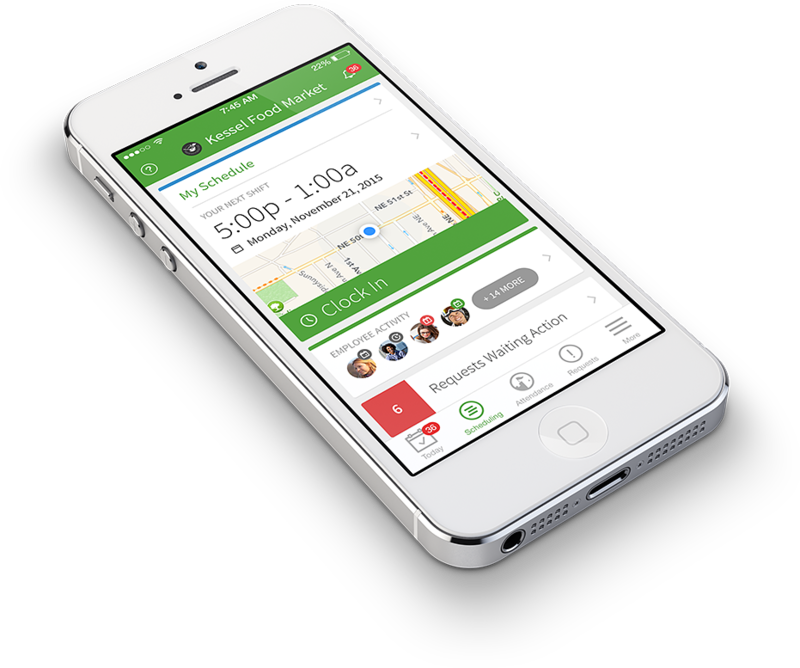 ﻿It's the easiest way to schedule and communicate with your hourly employees. Your employees can request shift trades and time off. You can make changes and fill shifts in seconds. Save tons of time and reduce absenteeism. Nearly half a million people in over 50 countries rely on When I Work for employee scheduling, time clock and communication. Spend fewer hours per week scheduling. Schedule staff via text message and email. Monitor overtime and payroll expenses. ​All this for less than €1 per employee per month. Setting up your schedule takes only a few minutes. The When I Work guided setup walks you through the process of adding employees, locations and positions. You can even import your employee list via an excel spreadsheet or CSV file. Minimal Data Entry - ​Add and invite your employees in seconds. When I Work will send them an invite via text and email as soon as you add them. Mobility with 24/7 Access - ​Staff stay connected to their work schedules 24/7 with text message alerts, mobile scheduling apps and email notifications. Nothing to Install - ​Since When I Work is web-based, you don't need to worry about installation. Just open your web browser and access the schedule, fuss-free. Minimal Tech Requirement - ​Even employees with basic mobile phones can take advantage of mobility. 2-way text messaging allows access to schedules from anywhere. The When I Work scheduler tool is incredibly easy-to-use and easy-to-learn. View the entire week’s schedule, and move shifts easily from person-to-person, day-to-day, until you are completely satisfied with the schedule. You can even save schedule templates, which make it even easier to get your schedule started and finished. See who's working now - ​Quickly see who's working. The Dashboard gives you a snapshot of what's happening with your schedule right now. Quickly find replacements - ​When you need to fill an open shift fast, send out a shift alert via email and text message to all qualified and available staff. Avoid schedule conflicts - ​Make your schedule run smoother by viewing each employee's availability as you build the schedule. Choose your view - ​Click to view the entire schedule, or quickly filter by position or location, so you never get lost in details again. With When I Work's exclusive communication tools, you will always know who's available, and your staff can rest-assured that their availability and time-off requests are up-to-date. 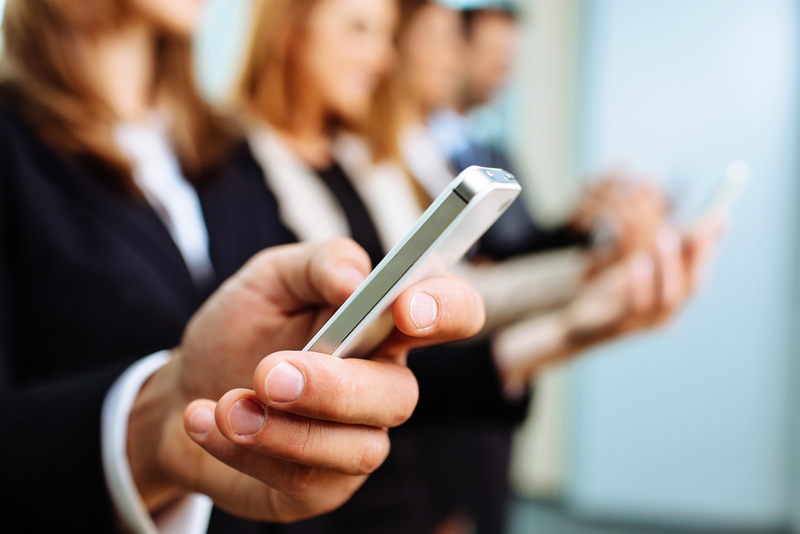 The 2-way text messaging service allows for direct response approvals to time-off requests. For example, when an employee requests a day off, managers receive a text message and can approve or cancel the request with a simple reply. ​Staff communication tools also include TeamTxt™, which allows managers to communicate with groups of employees via text message. Up-To-Date Staff Availability​ - ​When I Work allows each staff member to input and manage their own availability. Once they update their availability, that information is automatically added to the schedule, and used to help determine qualified and available staff while you schedule. Easy Vacation & Leave Managment - Employees can make vacation and time-off requests directly from their mobile phones or PCs. Managers are alerted via text message and email for approval. 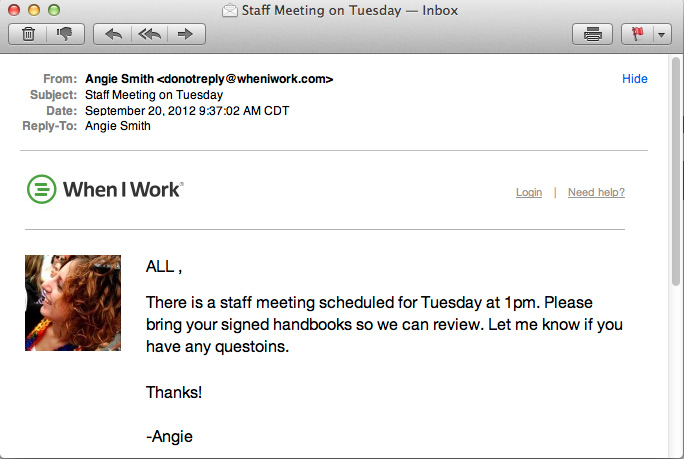 Employees are automatically alerted when they're request is approved, and the schedule is instantly updated. Smart staff communication tools keep employees informed and accountable. ​Communicating with staff can be time-consuming and unreliable. Finding a replacement, filling an open shift or even just letting everyone know about the staff meeting tomorrow can be a challenge. With When I Work's group email and TeamTxt™ service, you can communicate with your staff in one click. ​There are also powerful email and text message alert mechanisms in place to ensure everyone knows where they need to be and when. Group Email Service - The group email service, which is included in all plans, allows you to communicate easily with staff at any time via your desktop or mobile phone. TeamTxt™ Custom Texting - When I Work integrates exclusively with TeamTxt™, a group texting tool that allows you to easily send custom text messages to your staff. TeamTxt, the group email service which is included in all plans, allows you to communicate easily with staff at any time via your desktop or mobile phone. You and your managers can send mass text messages to employees any time for easy, reliable communication. Employees are more attuned to checking text messages rather than email or other forms of communication. Urgent, important or timely messages are delivered instantly so there’s never any delay. Target the entire group with a single text! Flexible Bulk Texting - Contact one employee, or talk to everyone at once. With TeamTxt, you're one click away from reliable, instant communication with your staff. Reliable communication - Send time-sensitive group messages, such as shift updates, to the entire staff, individual employees, or smaller employee groups, with just one click. Manager to Manager Communication - TeamTxt is also a great way for managers to communicate among each other before, after, or between shifts. It's a reliable way to let tomorrow's manager know what happened during today's activities. How it Works - TeamTxt expands on the 2-way text message service, which is included in all plans. To send group text messages, simply purchase TeamTxt credits as you need them. Credits cost as little as 3¢ each, and 1 credit translates to 1 text message to 1 employee. Self-schedule or fill shifts with 'Open Shifts'. Quickly fill open shifts or implement self scheduling using Open Shifts. ​Managers simply create an open shift, and employees are alerted via text message and email. ​Claiming shifts requires just a quick text message reply, then managers are notified and the schedule is automatically updated in real-time. Take an Open Shift - Staff members receive open shift details via their PCs or mobile phones. Each employee will only see the open shifts for which they're qualified and available. Manage Open Shifts with Ease - Easily monitor your open shifts within the schedule. Alert staff about open shifts via text message and assign open shift eligibility to specific employees. Get things done fast with Schedule Templates. Effective schedule templates save time and simplify scheduling. Creating the perfect schedule is an acquired talent. Some schedules work really well, while others don't quite do the trick. With When I Work's Schedule Templates, you can apply your knowledge to new schedules by copying past schedules that have worked well for you. Save a template - Once you have the schedule just right, save it as a template. You can save multiple templates and use them as needed, as many times as you want. Load a template - Queue up a template that provides the coverage you need. Quickly preview your template, and if it looks good, apply it and move onto other things. Learn from the past - Save a successful holiday schedule for use in following years, and simplify seasonal employee scheduling by using a template from the previous summer. Schedule even quicker - Templates cut scheduling time by providing a starting point. There's no need to start from scratch when you already know how your schedule works best. Track your expenses as you schedule. One click shows you potential overtime hours and wages. The Scheduler provides detailed resource and budget management information. Easily track personnel by position, hours or payroll expenses. In one click see your payroll forecast and overtime expenses. Track Your Budget - Quickly see if your schedule aligns with your expected payroll expenses. In one click, monitor expenses and see what the payroll forecast looks like with your current schedule. Reduce Overtime - Make more informed decisions while scheduling. If an employee is scheduled to work over their budgeted hours, the Scheduler will instantly alert you next to that employee's name. Text message and email alerts keep staff connected, and notify them of upcoming shifts, schedule updates, requests and open shifts. Automatic alerts mean fewer missed shifts, and a better-prepared workforce. Schedule accessibility and mobility help keep employees happier too by lowering work-related stress. Shift Reminders - Boost accountability with text message reminders. Employees can configure shift reminders to arrive when they're most helpful, whether that's a few hours, or an entire day, in advance. 2-way Text Message Alerts - Employees don't need a fancy smartphone, or even a computer, to view their schedules. They can just text the word "SHIFT" and instantly get their next shift information sent back to them. Easily schedule staff across multiple locations. Avoid confusion and overlapping schedules by separating locations. The Scheduler lets you switch between locations as you create the schedule, allowing you keep each of the schedules you manage entirely separate from one another. ​You can even share employees between locations, and at a glance see who's available when and where. Schedule Departments - Use Locations as departments, and setup an independent schedule for each department. Add Supervisors to each Location to provide users unique access to the schedule. Include Addresses - For each Location you create, add an address for additional convenience. When I Work automatically integrates with Google Maps to provide quick links for directions and a map. Schedule staff off-site and keep them mobile. Easily set up job sites so employees know when and where they need to be—everyday. If you need to schedule employees for off-site shifts, set up ‘Sites’ and assign staff at specific job-sites or addresses. This allows your staff to stay mobile and quickly see where their next shift is from their mobile phone. Event Scheduling - If you operate a catering or other event-related business, setting up Sites allows you to quickly schedule your staff for each event. Always know who's available and where they're supposed to be. Project Scheduling - Use Sites to schedule staff by-the-project. Setup a project as a 'Site,' then assign staff to a shift, and tag that shift to the project you want the employee to focus on. Happy employees are more productive, more accountable, and will stick around. ​When employees are not stressed about their work schedules, they are generally happier and more likely to remain with your business. When I Work gives your staff 24/7 schedule accessibility, automatic shift reminders, mobile schedule updates, and more. ​Not only does this make them more accountable, but it also makes them more satisfied and at-ease with their jobs. Reduce no-shows - When your staff have round-the-clock access to their work schedules, they are less likely to miss shifts or misread the posted schedule. Improve timekeeping - Shift reminders from When I Work give employees an extra push to be on time. Empower employees - With When I Work, your employees can make your job easier. Each staff member can set their availability, request time off and trade shifts with co-workers, — all via their mobile phone or any web browser. Sync with Google, Outlook, iCal and Facebook. Scheduling with your favourite apps has never been easier. Not only can employees view their work schedules online via When I Work, but they also have the flexibility of syncing it with their favorite online calendar app — such as Google Calendar, Outlook, iCal, Thunderbird, etc. Viewing their schedules alongside personal responsibilities helps keep your staff organized, and aware of any possible conflicts between responsibilities. 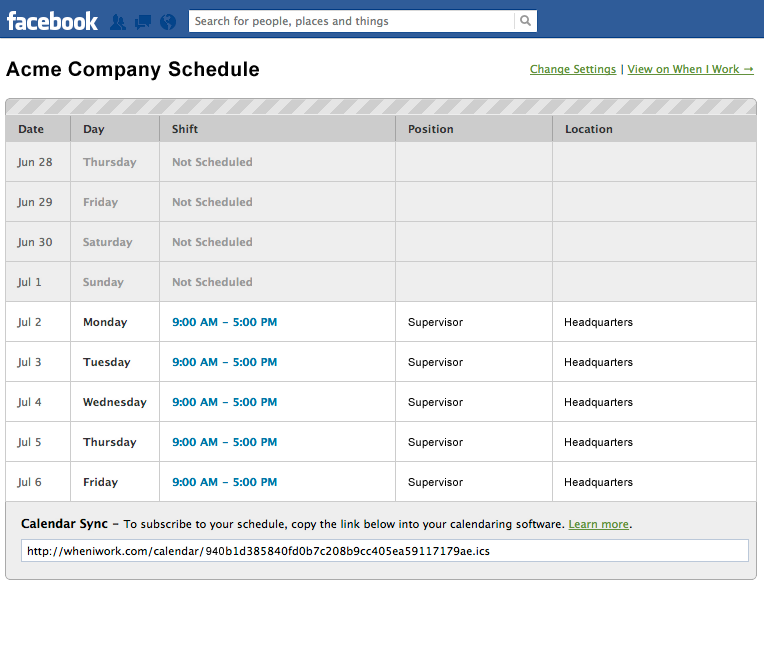 Employees can use the When I Work Facebook App to view their schedules without needing to log in to When I Work. This puts their schedule where they hang out the most — on Facebook. 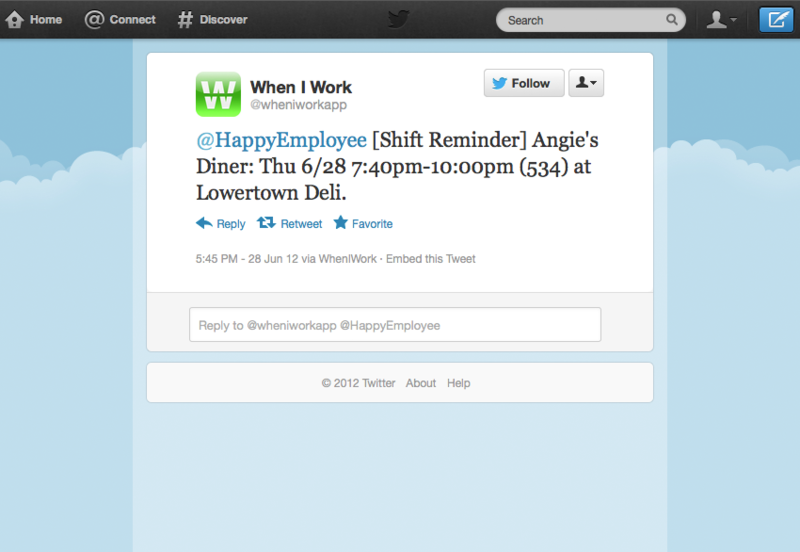 Employees not only get shift reminders sent to them via text message, but they can configure their schedules to remind them via Twitter mentions from @wheniworkapp. If you are a multi-unit operations manager or have more than 100 employees, please contact us for a quote.